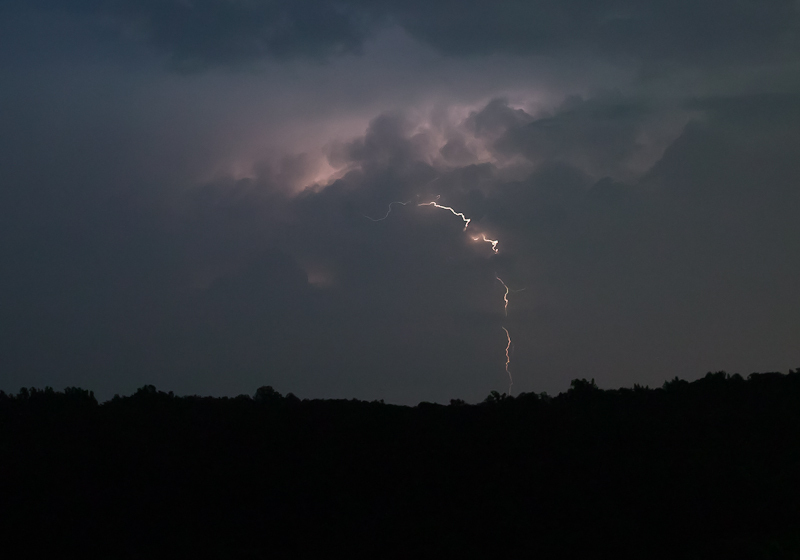 As night was falling, a rumbling thunderstorm moved in from the west. Common True Katydids were calling raucously from the oak woods in back of my house with temperatures in the low 80s. The interplay of the storm and the katydids was a delight to my ears. Featured here is a portion of that recording. Listening with headphones will put you right in the midst of the action. 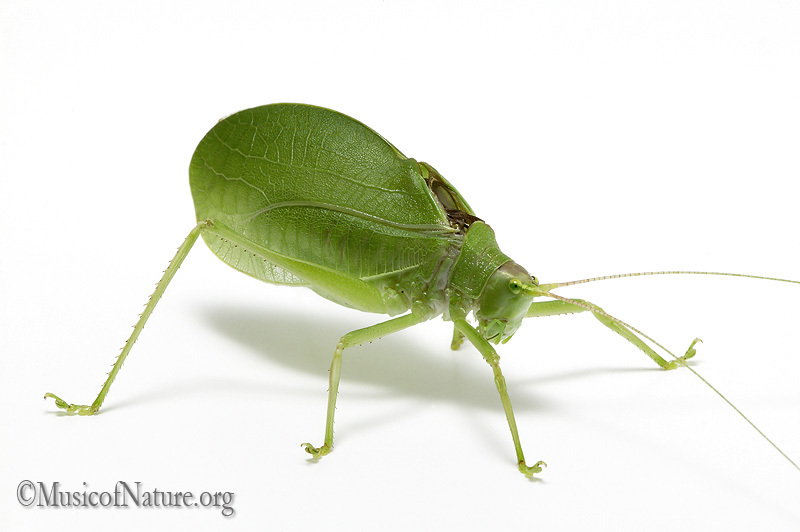 Common True Katydids are among the loudest of our night-time singing insects. They are flightless, having to walk from tree-to-tree through the vegetation or on the ground. Severe storms can dislodge a number of these large katydids and send them to the forest floor. Looking for them after a very windy storm may yield a number of these handsome creatures walking along the ground in search of a tree to climb. The harsh, rattled call of the males, ch-ch-ch, is familiar to most anyone who lives within their range. Groups of males in one tree will often alternate singing with another group of males singing in a neighboring tree, thus creating a pulsating cadence. I hope that you enjoy this interesting recording of these night-time chorusers. Common True Katydids singing during an approaching thunderstorm. Recorded by Wil Hershberger, July 31, 2012 in West Virginia. Hi there! I am a naturalist, writer, nature photographer/videographer and natural sounds recordist. I have been interested in the natural world all my life. I am excited about bringing The Songs of Insects to the world as a premier web site for the sharing of information and inspiration of the world of our crickets, katydids, and cicadas. Learn more about me at Nature Images & Sounds and Google+. This makes my heart ache so deeply with memories. One of my all time favorite soundscapes! This is wonderful! I would imagine that this year’s hot summer caused this insect’s populations to peak. Hi Wil, That’s a great recording! The balance is just perfect. It reminds me of my Appalachian Trail days in 2010. By the way, may i have a downloadable version of this recording, so i may put it on my portable music player and listen to it before going to bed. Thanks. Thanks Wil! I already own a Zoom H2 Handy Recorder that I have had for a few years. I just assumed this would be too “low end” to do much justice to the beauty of nature sounds. Guess I will work with it and see how it goes. Give it a try Joni. If you have any questions please feel free to ask us. Wil, this is quite splendid! Downright exciting, and the katydid chorus/thunder balance is perfect. I have to admit, though, I’m jealous of your thunderstorm. We’ve had so very little rain in Cleveland this summer. Great recording! I am a nature photographer & environmental educator. I would like to do some recording that would be quality enough to post on my blog and Facebook to use for educational purposes. What specific equipment would be best without going high end/cost? Any sites that are good for info? I read Cornell Lab/Macauley info. A great starting point would be the Zoom H4n recorder with built-in microphones. There are a lot of these smaller, “pocket” recorders that are reviewed and discussed in the Yahoo group. Wil, that is truly great! As Lang said, the katydids often overwhelm the recording, but the distance here is perfect. The thunder is audible, but also isn’t overpowering. I have been making amateur efforts at recording such sound spectacles as I call them and I know how hard it is to get all the sounds just right. Great work, keep them coming! Thank you very much Nick. Placing the microphones can be an art in itself. Trying to balance the “players” within a sound field can be tricky. Lots of experience can make finding a “sweet spot” a less daunting task. Thanks Lang. There is about 15 minutes to the entire recording. Once it started to rain the katydids stopped singing. Wonderful recording Wil! Very pleasing to my ears. The katydids do not overwhelm as they often do. And the thunder sounds great, both over my speakers and through headphones. How long is the original recording? Notify me of followup comments via e-mail. You may also subscribe without commenting.